Just fitted my last monthly sponsor post into the last day of July. It's Plush Addict's turn, and as usual, Kellie-Rose has some great offers available including 15% off Kona cottons until 6th August. Fat Quarter Bundle Blend All is Bright Holiday: 7 fabrics. Perfect for Christmas in July fans who like to start their Christmas makes early. Zesty colourful selection with a touch of gold. Art Gallery: Skopelos Paprounes Crimson Knit. Beautiful large floral print on a cotton/lyrca jersey. Wide width. Fat Eighth Bundle Makower Linen Texture Brights. Small cut so good for those that like to make lots of little items. 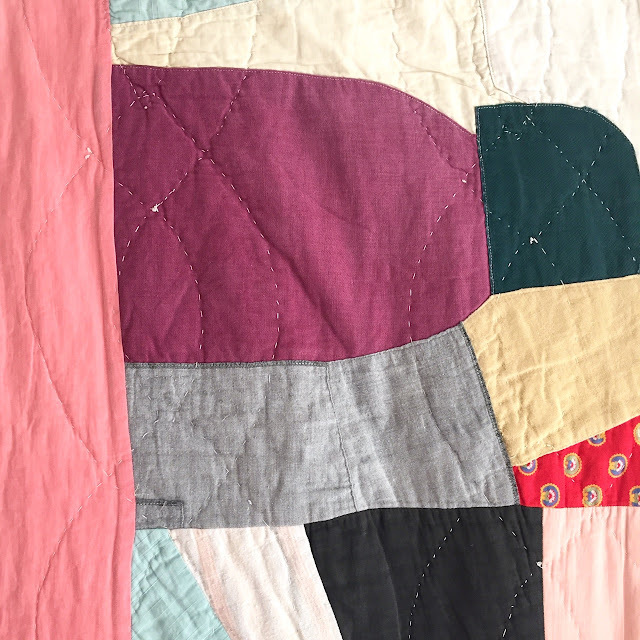 Bright colour quilting cotton with a texture-look print. Michael Miller - Candy Shop. Retro print with lots of sweet treats! Kona Solids "Kahuna Kona" FQ Bundle, 36 Fabrics. 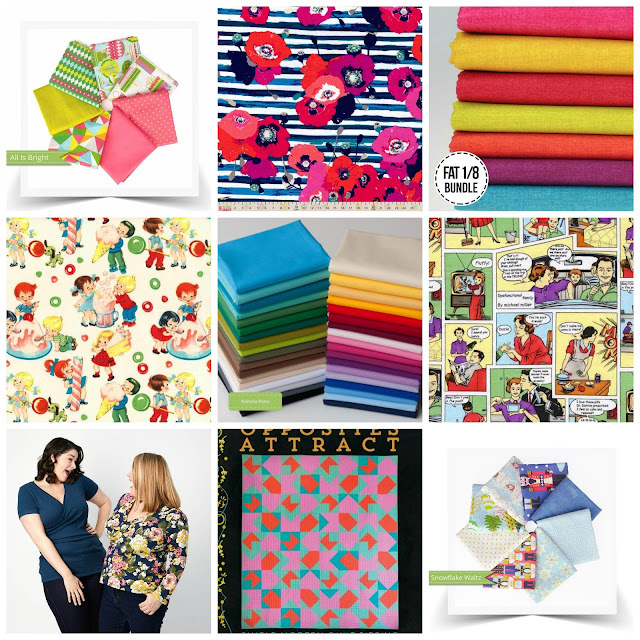 A bright, rainbow selection of fat quarters! Note some colours may be substituted according to stock levels. Michael Miller - Dysfunctional Family. Lots to recognise in this print! Alison Glass - Opposites Attract. 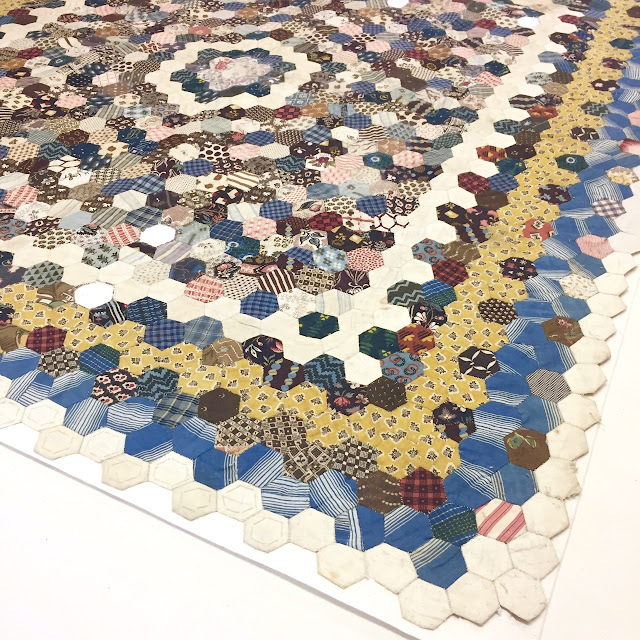 Alison Glass quilt pattern from her Skill Builder series. Cashmerette Sewing Patterns - Dartmouth Top. Cross-over jersey top, sizing from bust 40"- 56" and cup sizes C to H. See other Cashmerette patterns here. Fat Quarter Bundle Snowflake Waltz in Navy Graphic prints by Maude Asbury for Blend fabrics featuring characters from The Nutcracker. 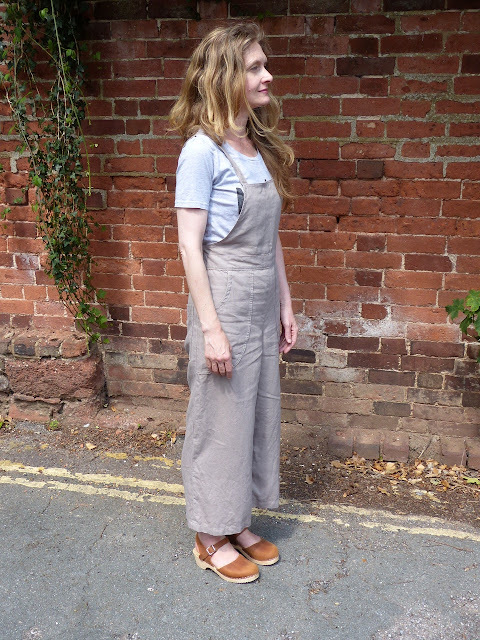 I've always loved dungarees and aprons; 70s styling, skirts that wrap, dresses that tie, a bib front and now is a good time for those sewing those styles. 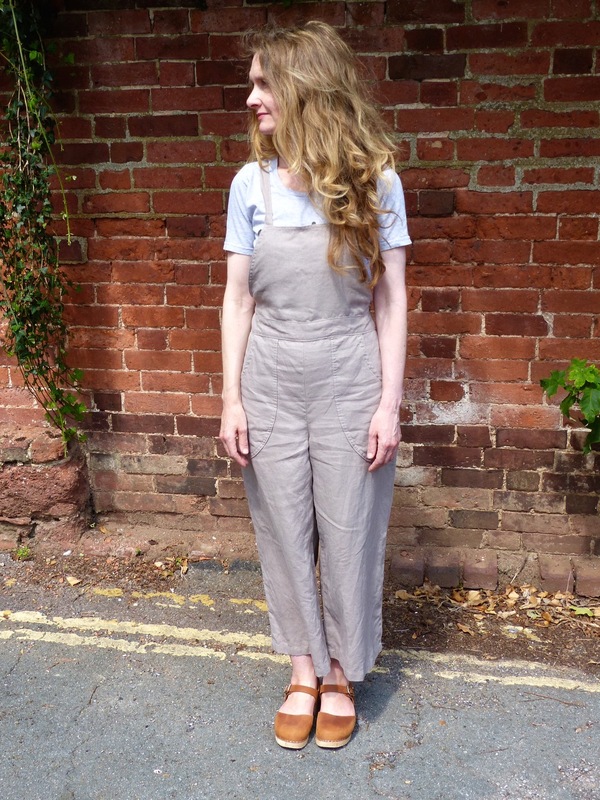 There's such a range of patterns available and I was finally nudged into action by Sarah of Pretty Fabrics and Trims who mentioned the Burnside Bibs by Sew House Seven in an email exchange. 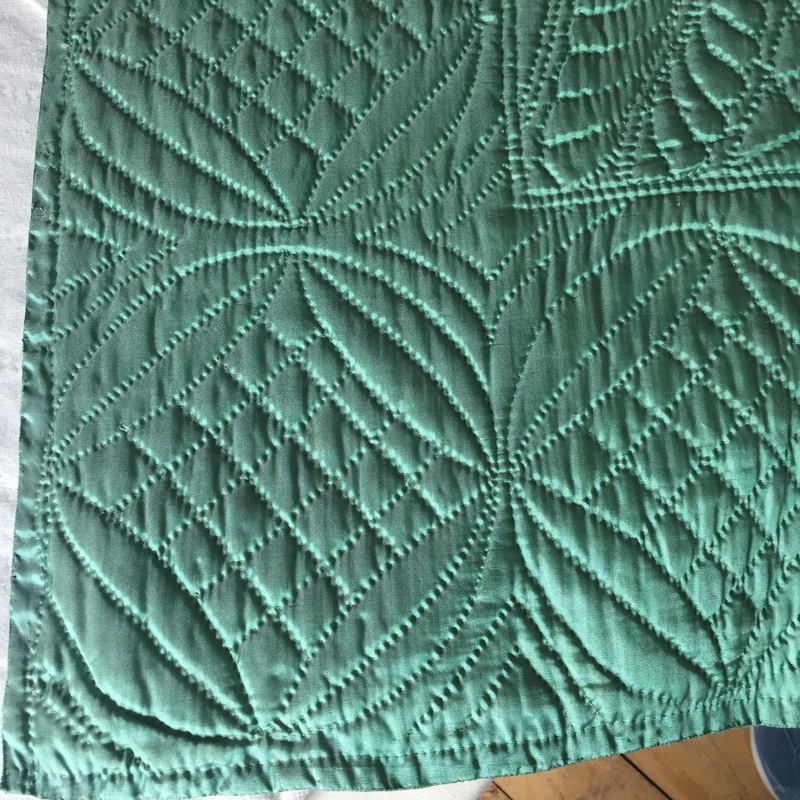 I had two metres of gorgeous linen from a destash purchase, I had the pattern printed in copy shop format, I was good to go! I chose version 1, a more fitted trouser with an invisible side zip and I opted for a straight across bib. The pattern also includes a looser trouser with pull on waist and a curved bib so you can mix and match the style elements. Size wise, following the body measurement guidelines, I cut out a size 2 bib; widening to 4 at the waist, and a size 4 lower half. I could manage to squeeze a full length pair out of 2 metres but I wanted the summery feel of the cropped style. The length of these uses the pattern hem line; I am 5' 5"/ 164cm in height. 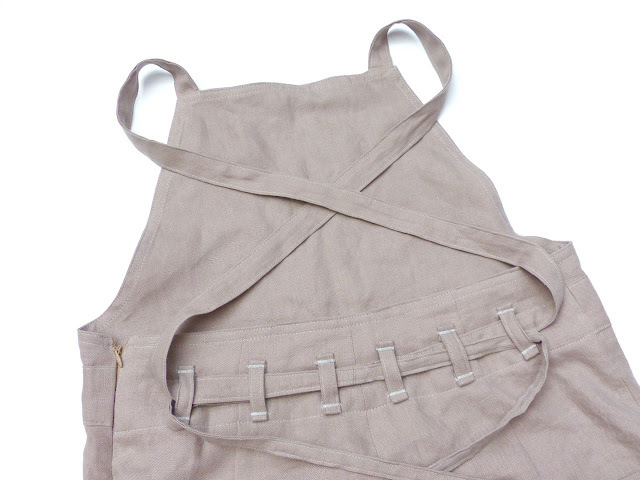 It's a well written pattern and fitting is minimal as the apron ties bring the waist in and out. 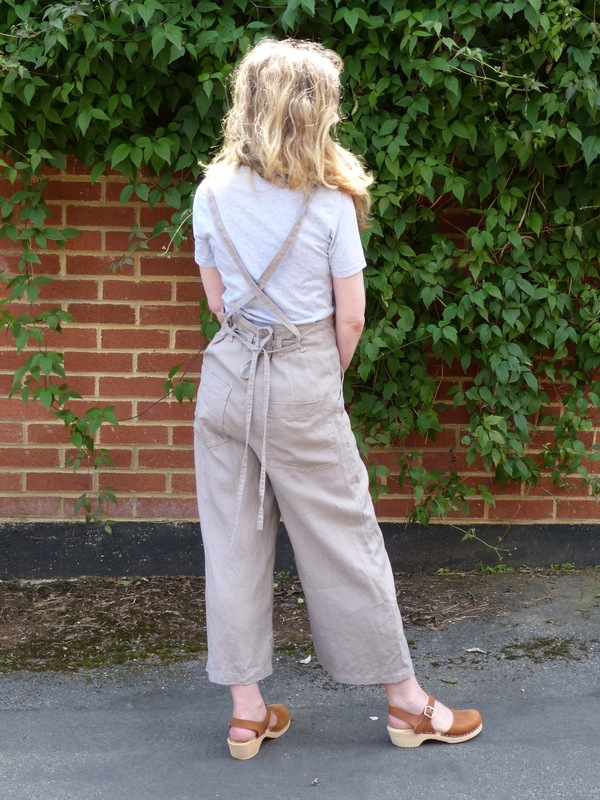 The only change I made was adding a layer of Liberty lawn to interline the pockets as they are sewn on to the front and I thought the linen would bag out in use. I also added a light fusible interfacing strip into the zip side seams. 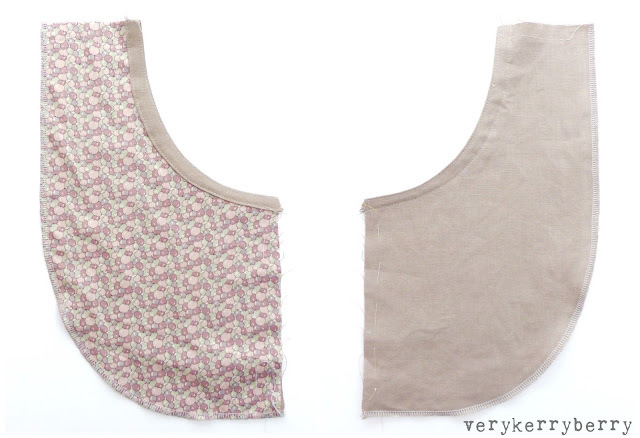 Otherwise, everything was as written in the pattern.A future change I would make would be to stay stitch the underarm section of the bib and maybe interface it with a very lightweight fusible as it did go a little out of shape at the edges. 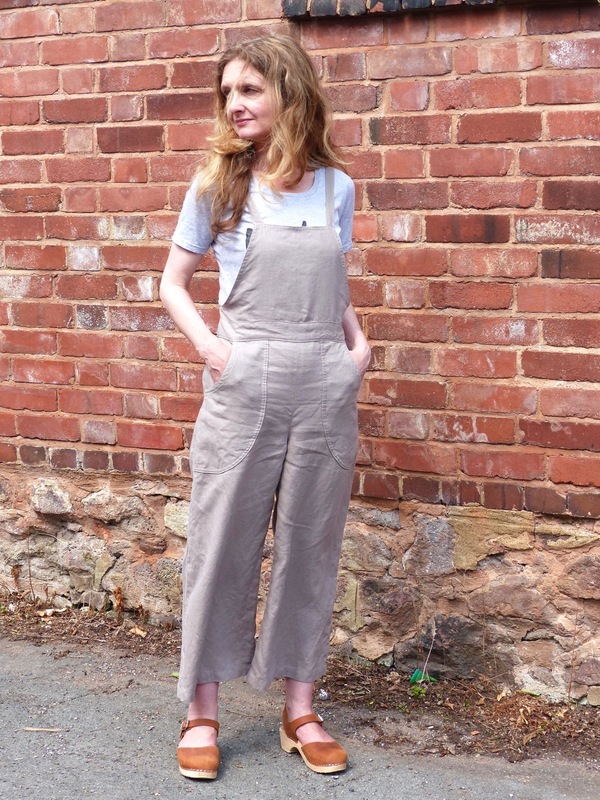 The fit is good, especially in the trouser section. Dungarees are not the most flattering look on the derrière but I think these have the balance about right and you could easily make a few adjustments to make them more fitted, or choose the looser trouser pattern and have a baggy look. The size 2 bib is very slightly short and in hindsight, size 4 throughout would've been fine but the difference is minimal. 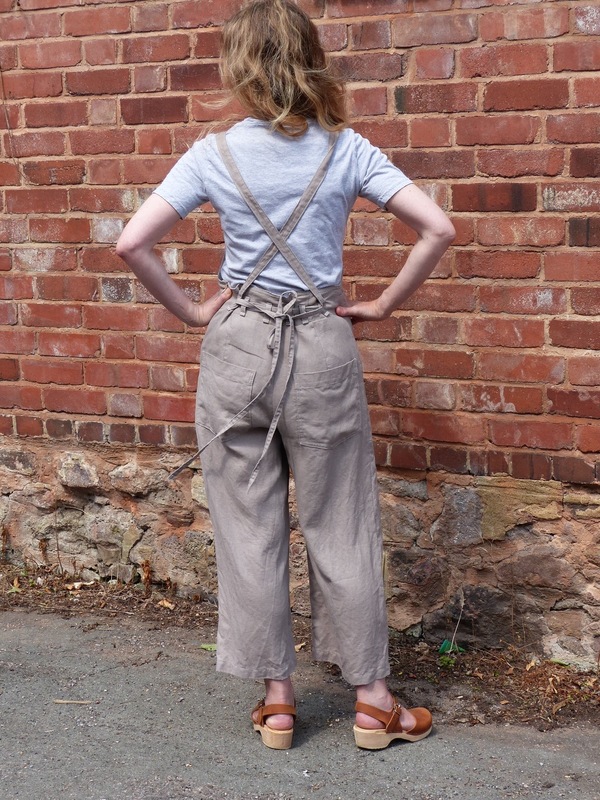 They are a satisfying make and great to wear on a hot day out, the leg has just the right width to it, they look wide leg and not like clown pants! I have the Tea Dress in my dressmaking queue, along with some beautiful linen from USA so I'm tempted to start that next. July at Eternal Maker: Flash Free Shipping Offer! I'm just sneaking into July with my last two sponsor posts; it's always a busy month for me with family birthdays, end of term and prep for my summer schedule in the day job. 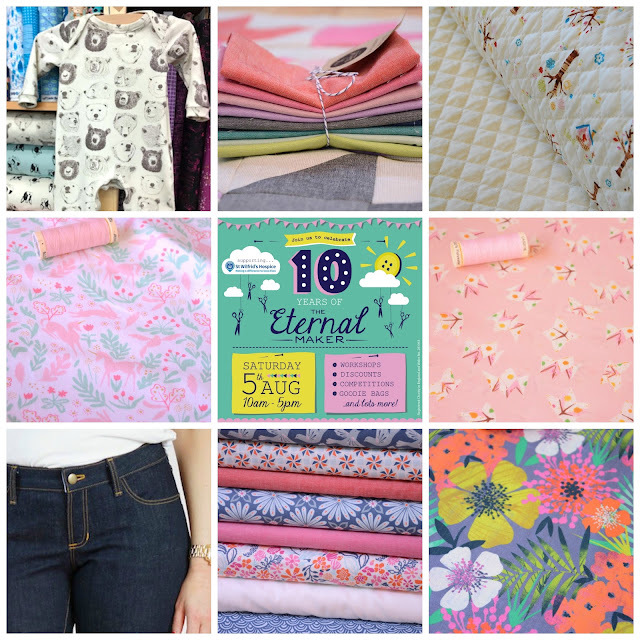 It's Eternal Maker's turn today and Anna is also busy with a 10th Birthday party planned at the Chichester shop on Saturday 5th August. She also posted a flash shipping offer - free postage over the weekend if you spend over £10, add SHIP-FOR-FREE online to get your shipping for free, take advantage whilst you can, runs until the end of Monday! Offer includes fabrics in the sale. Two Stitches Grow Babygrow Kit - Bears contains all you need to make the TWo Stitches babygrow up to 24 months sizing, fabric is by Kokka. Sevenberry Yarn Dyed Rainbow Fat 1/8th bundle. These are gorgoeous shot cottons, the warp and weft are two different colours- white and the main fabric colour. I have a few of these and I love the effect and the quality. Pre-Quilted Woodland Party fabric by Cosmo-Tex. Perfect for baby projects. Sarah Jane for Michael Miller, Folk Magic Knit, 100% cotton jersey, perfect for childrenswear and Two Stitches patterns. For those who can travel to the bricks and mortar store, Eternal Maker is holding a birthday party from 10-5pm on Saturday 5th August with workshops, discounts, competitions, goodie bags and fundraising to support St Wilfrid's Hospice. There will also be a Maker's Fair so bring cash to support and buy goodies from local makers. Online customers can take part in a raffle as well as supporting St Wilfrid's Hospice, see here for details! Heather Ross for Windham, Sleeping Porch, Fortune Teller in Pink, Cotton Lawn. Such a pretty pink and a cute quirky print. Jeans: Build a Bundle. All the bits you need to sew a pair of jeans in one long order list, just click for the things you need- large choice of fabrics, patterns, needles, jeans buttons and more. Great idea from Anna! Kate Spain for Moda, Early Bird. Build a bundle. Summery bright pretty fabrics, make your wn custom bundle. Neon Tropical Floral, Stof France. Lightweight Floral. 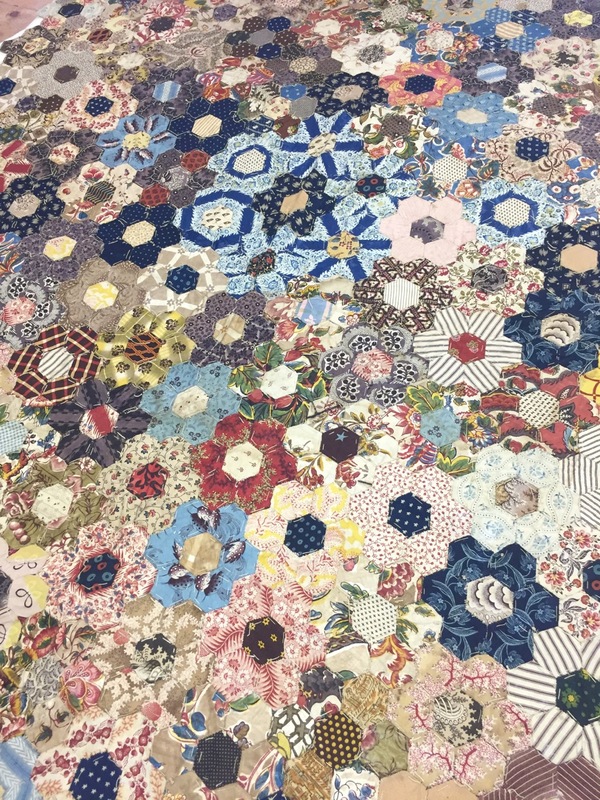 Glorious dressmaking fabric would make the most gorgeous summer pyjamas, or many other things! 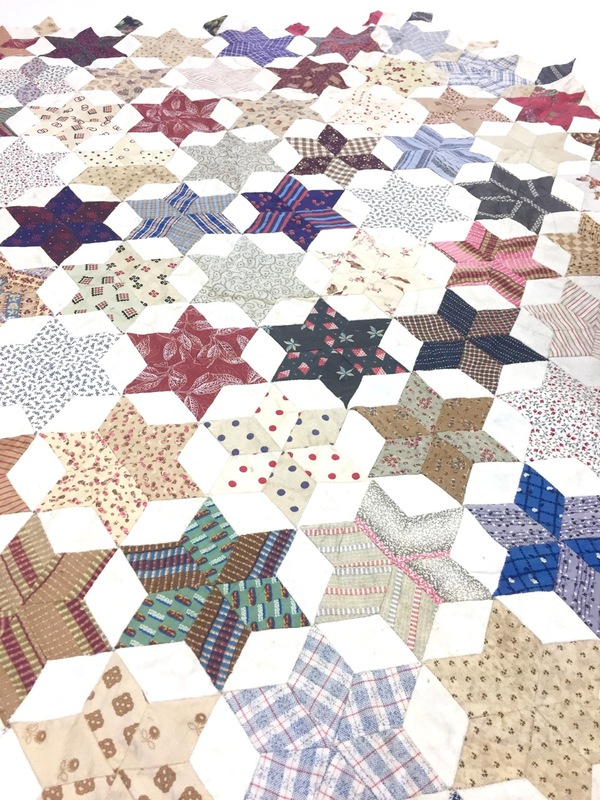 Continuing the Quilters' Guild exhibits that were on display at Exeter Sewing Machine Shop, these next examples are all twentieth century and came with detailed historical information from the guild. 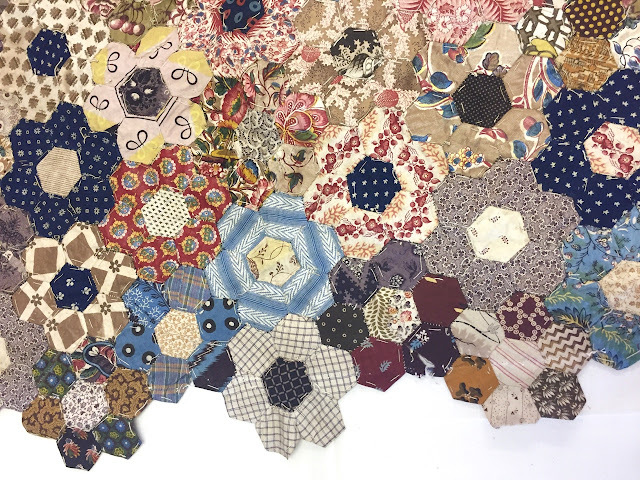 The first can be attributed to a maker, Elizabeth Ward Originally from a farm owning family in Lincolnshire, Elizabeth worked in a Leicestershire dairy as a young girl and had her own family in the 1920s when she also started this patchwork. She married against her family's will and they cut her off, reconciling after she had children. 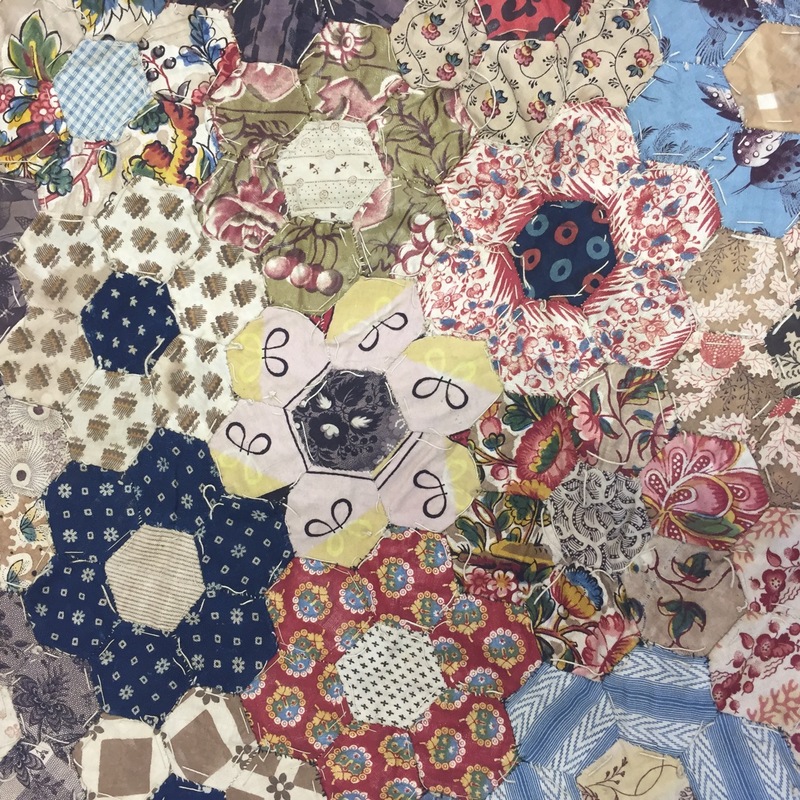 The patchwork was kept by her granddaughter after Elizabeth died in 1961. 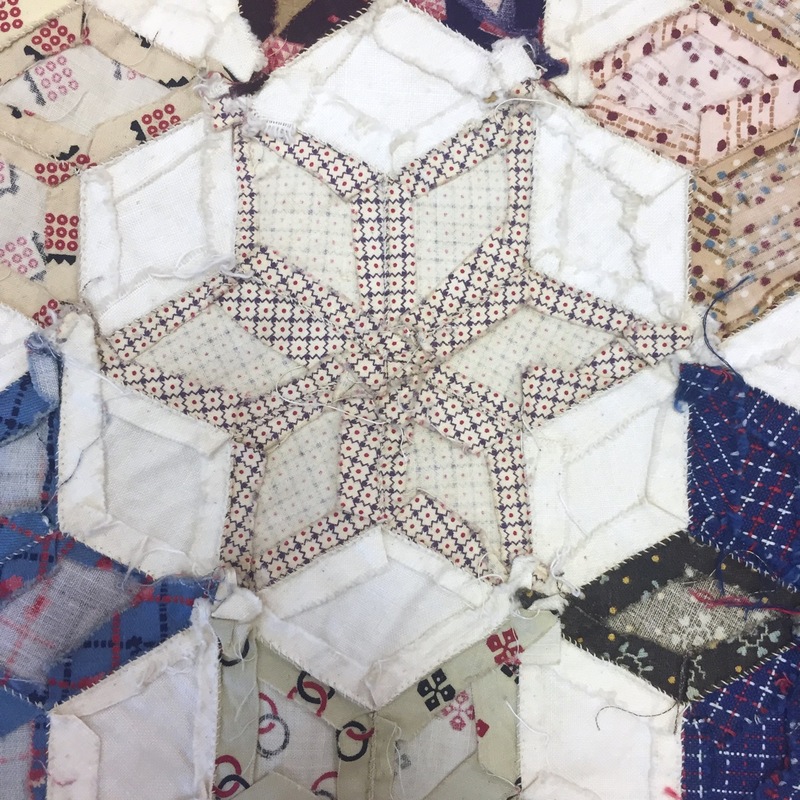 It's English paper-pieced and the stitching is in white thread throughout with small neat stitches. I loved the next example. It was bright and modern with some of my favourite colours- shell pink, browns, cobalt blues and mint greens! It's called the Medallion Log Cabin Coverlet and dates from the1930s. Made by Alice Stagg, who had a tailoring business, Fone & Stagg, in Crewkerne, Yeovil Somerset. 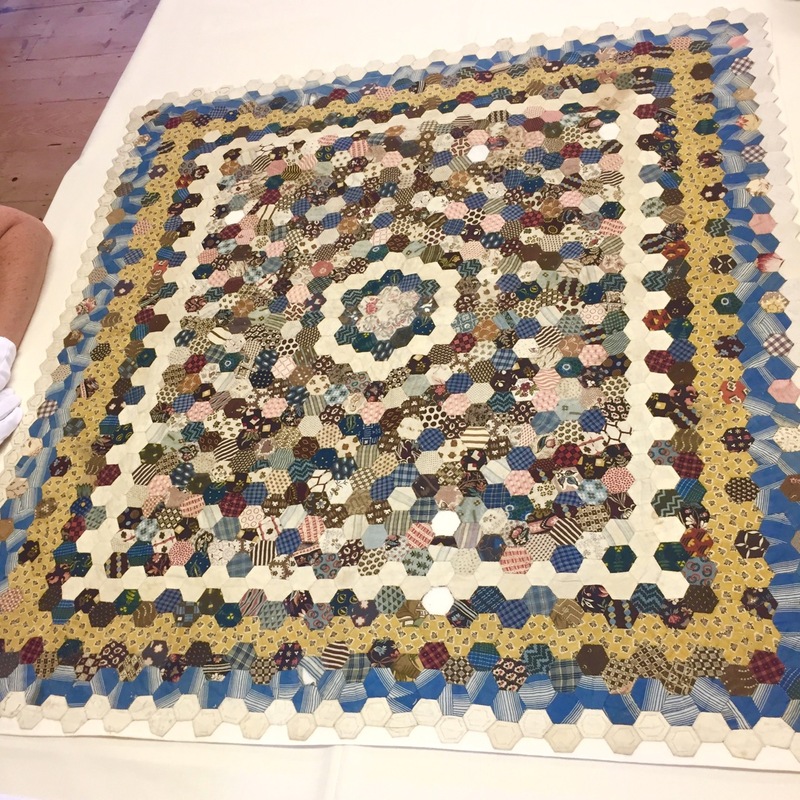 It was known as the 'Polish Quilt' in her family and the guild suggests this could refer to it being made close to the outbreak of World War II in 1939. A picture of her tailoring business can be seen on this page, it's on the right in the black/white photo of how Market Street used to look. The fabrics are thought to be dressmaking scraps and you can clearly see the textures- crepes in particular. They made me think of bias cut 1930s dresses. There are also lightweight brocades with metallic threads, satins, velvets embroidered fabrics and lots of dress suitable prints. There are lots of different fibres too, silks, viscose and rayons along with cotton. It's not quilted so there's movement and drape in the fabrics and the blocks are less rigid than a usual log cabin. 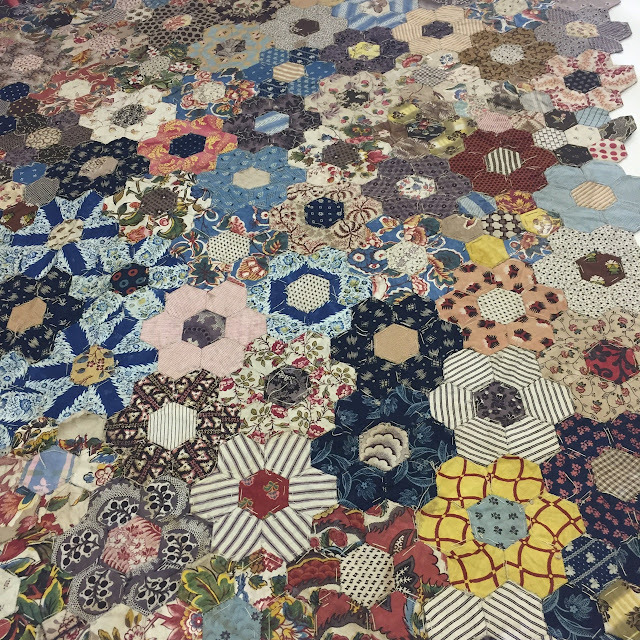 They reminded me of string quilts with all the mismatched lines and geometric pattern, as well as God's eyes. Probably my favourite from all the exhibits! 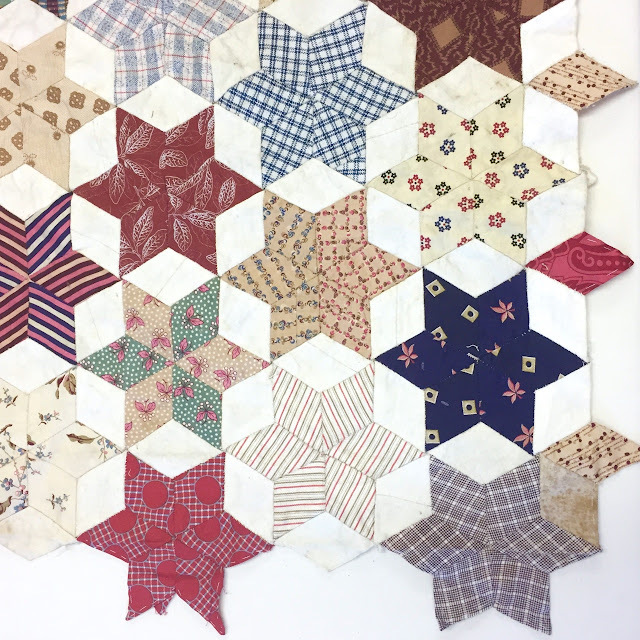 I love the idea of repeating this today with Liberty lawn, chambrays and other dressmaking remnants. 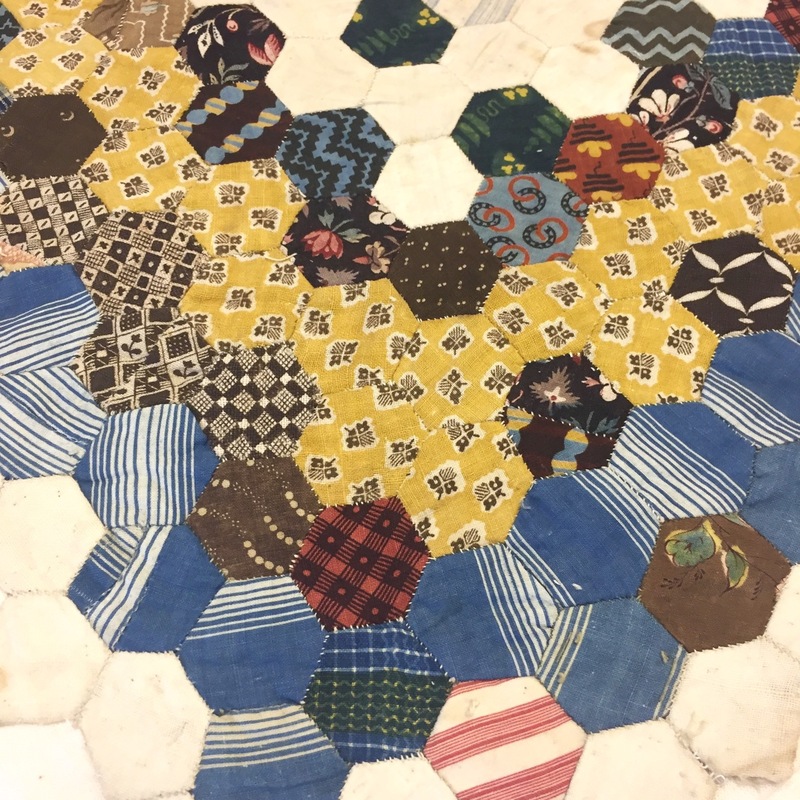 There were a few wholecloth quilts in the travelling collection and this caught my eye because the colour and the fabrics relate to Alice's coverlet above. It's rayon, double-sided with a thin layer (maybe flannel) in between. 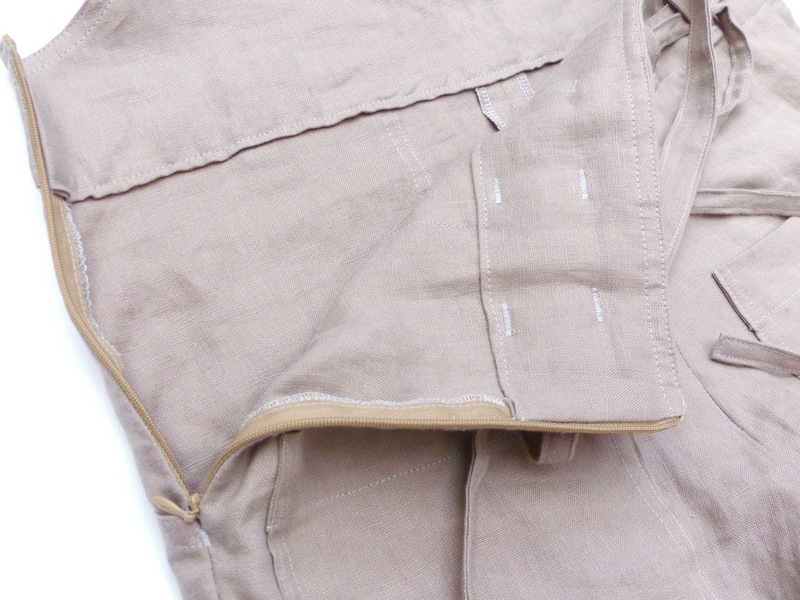 The edges are the fabric selvedges (it was around 90cm wide) and the top and bottom were whipstitched together. 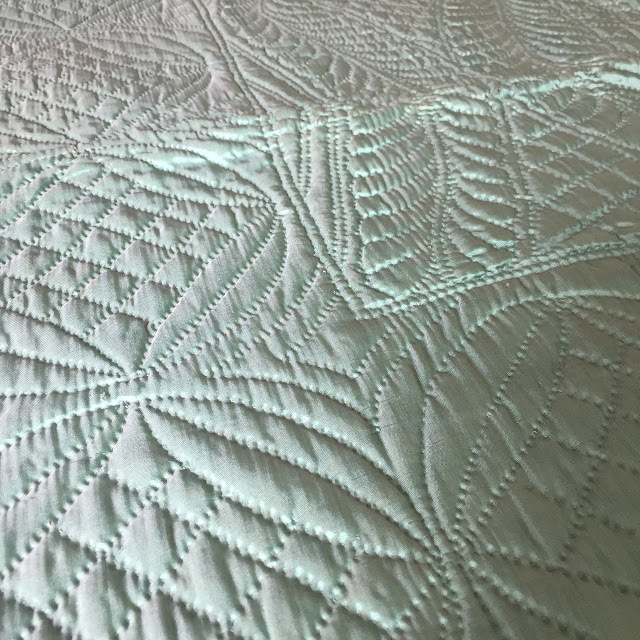 The quilting was phenomenal, so neat and regular with quite a dense quilting design. Dates from the 1930s. You can see a selection of wholecloth quilts on The Quilter's Guild website. 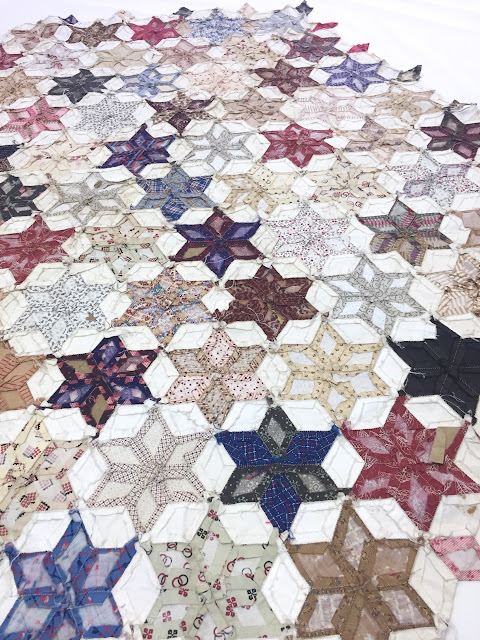 This quilt had a lot of resonance for the current charity activities in quilting following the Manchester bombing and the Grenfell Tower fire disaster. This is quilt is from the Canadian Red Cross Society sent to the UK duirng World War II - the label is in the top right-hand corner. 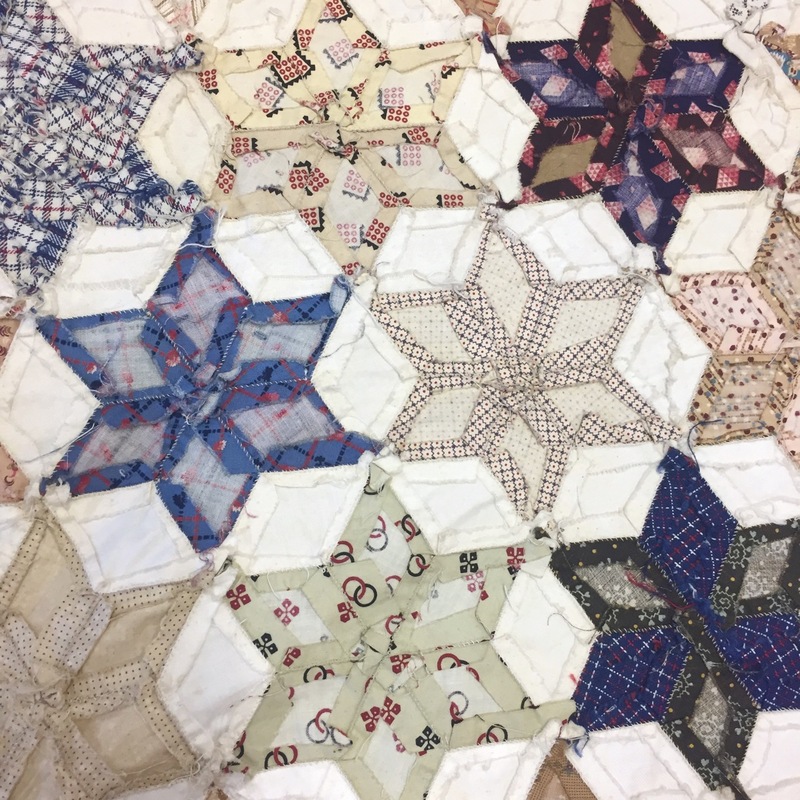 The piecing is fast, there are applique elements and visible selvedges as well as lots of improv style shapes and patterns, a quilt made for speedy dispatch. You can read in more detail about quilting in World War II, and in particular about charity quilts from allied countries like Canada here. 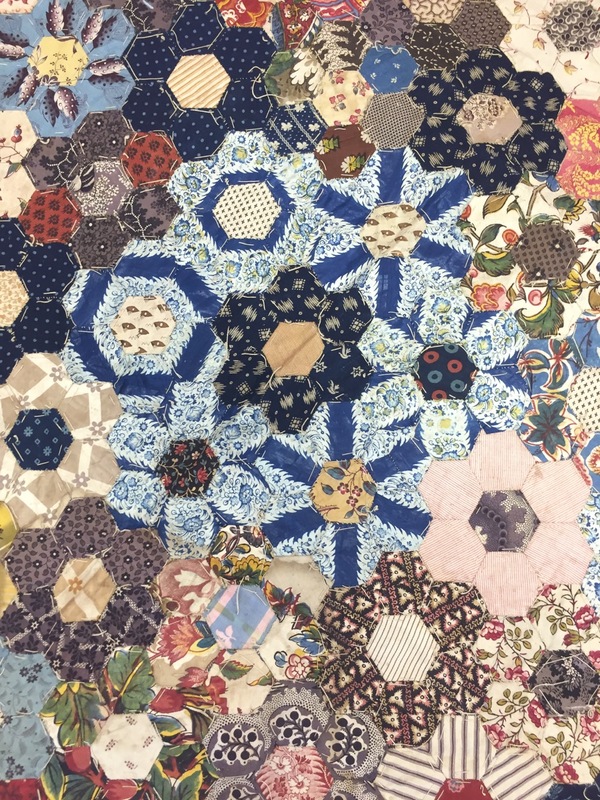 Quilts like this were sent for evacuated and homeless families, the domestic victims of war. A big thankyou to Jenna and the rest of the team at Exeter Sewing Machine Company. 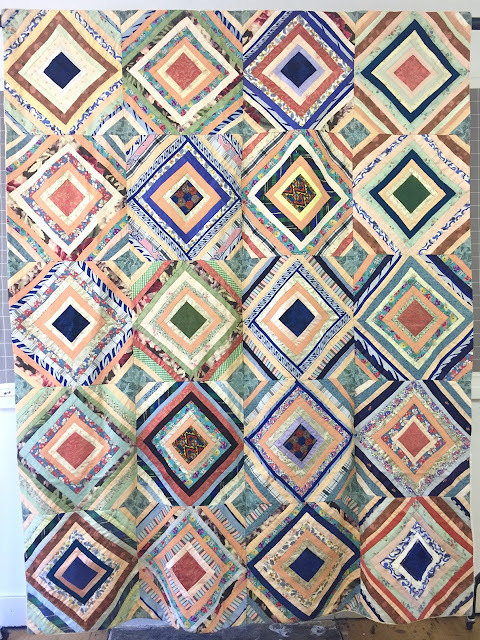 The Quilters' Guild touring exhibitions are a delight and I always learn so much! 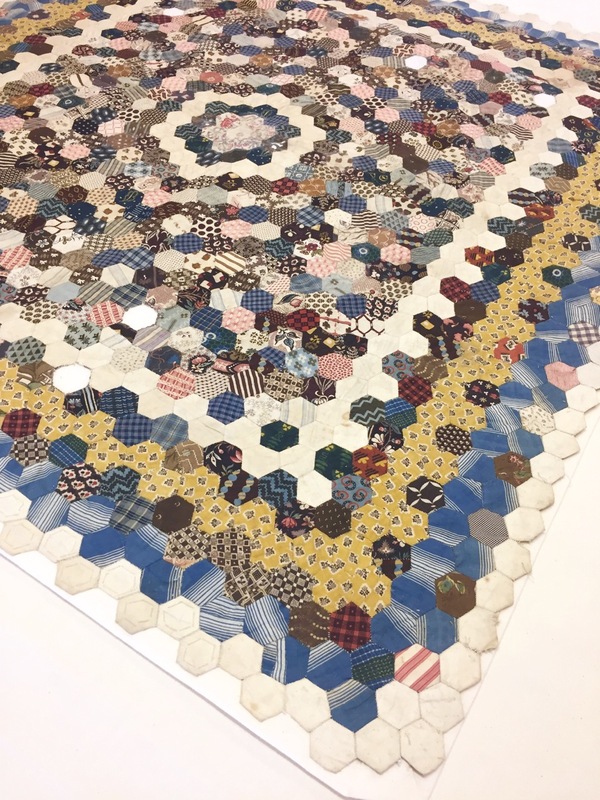 I've been enjoying a week off work which has included a lovely few days away in Cornwall with my husband and some beautiful historic quilt exhibits from The Quilters' Guild at my local quilt shop, Exeter Sewing Machine Company. Shop owner, Jenna, hires a selection of pieces from a collection that travels around the country and customers can book viewing time slots. It's a free event and Jenna always allows plenty of time for us all to look over the exhibits. I took lots of photos so I'm going to split this across two posts: this post features hexagon nineteenth-century quilts and second will feature a range of twentieth-century quilts and fragments. 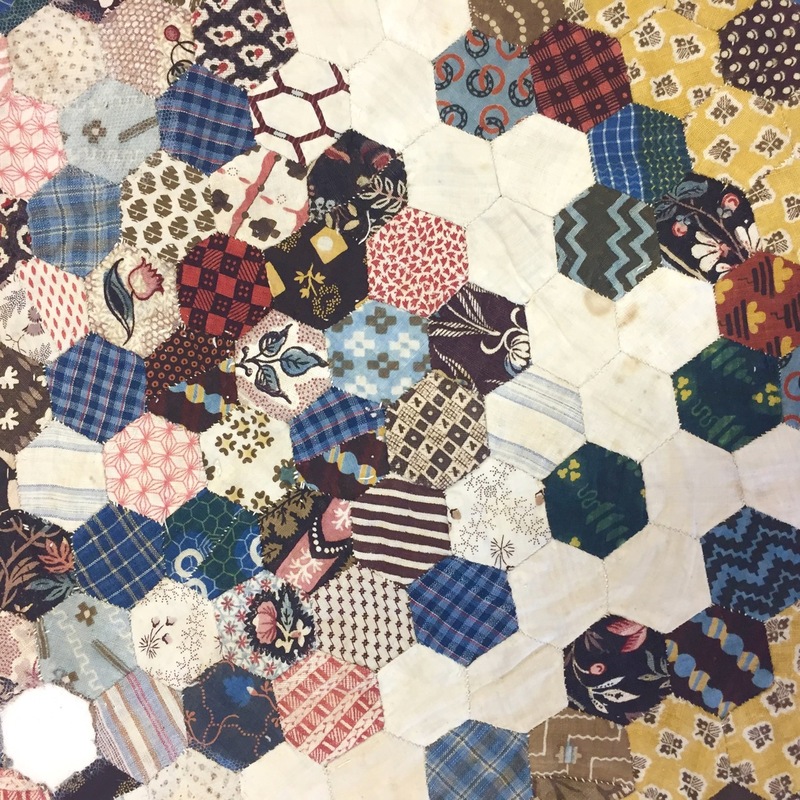 I'm not usually a huge fan of hexagons but these two examples were so charming. The first is sewn on to a backing for display so only the front can be seen. It was the colour range that really grabbed my attention, especially the mustard yellow and blue border. The hexagons were really quite small- maybe an inch at the widest point? You can get an idea of the scale in this photo with the arm underneath! Note the white gloves worn for any handling of the exhibits. Jenna leads the way carefully taking the quilts out of their storage bags and laying them out for us to look over. Close up you can see all the adaptations, the pieces sewn together within a single hexagon and the wonderful range of prints used. 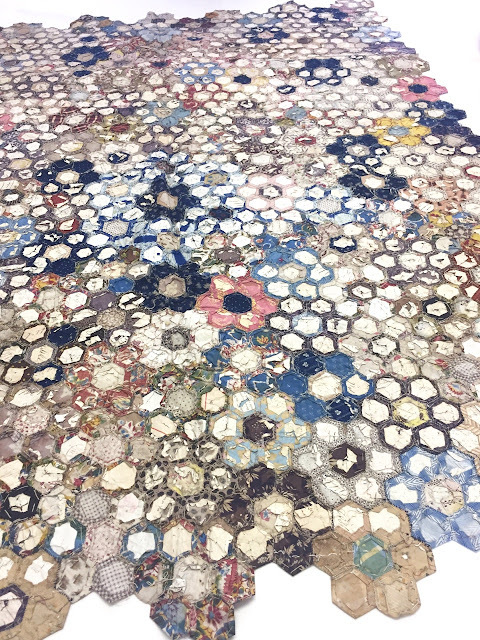 There was some variation in the regularity of the hexagons but the overall effect was so pleasing! This piece dates to the earlier part of the nineteenth century. 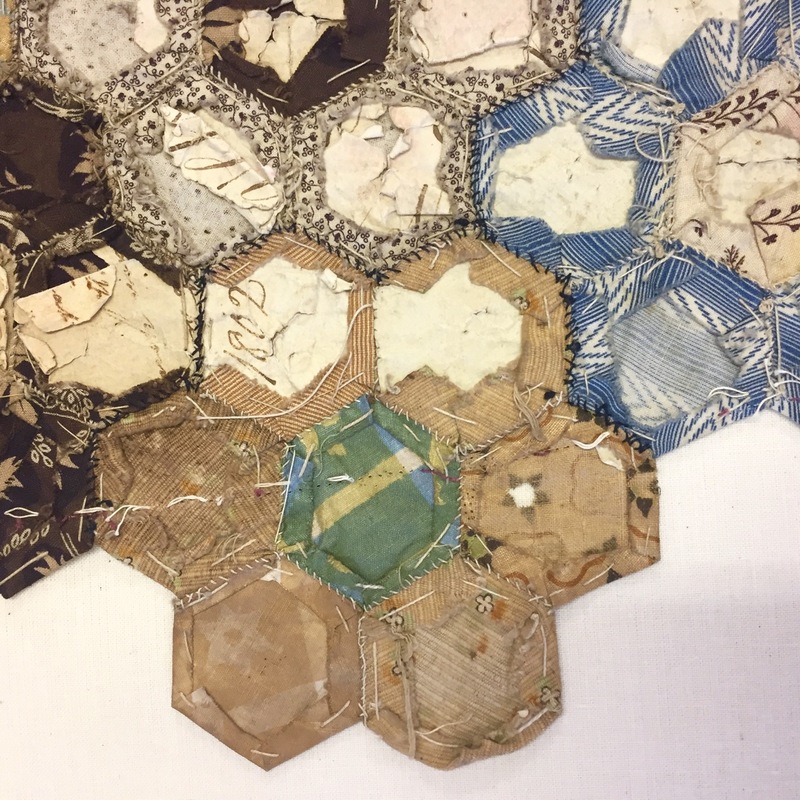 The second example has larger hexagons with many of the papers intact. They are stitched into rosettes, some very fussily, some almost haphazard and lots in between. There's a range of fabric weights from lightweight fine shirtings through to heavier chintz fabrics where the shiny glaze and thicker threads can still be seen. The reverse is just as fascinating with lots of handwritten letters and papers being used for the hexagons. It was a fascinating piece to look over. You can see a date below, 1802! The Quilters' Guild date this uncompleted piece to around 1840. 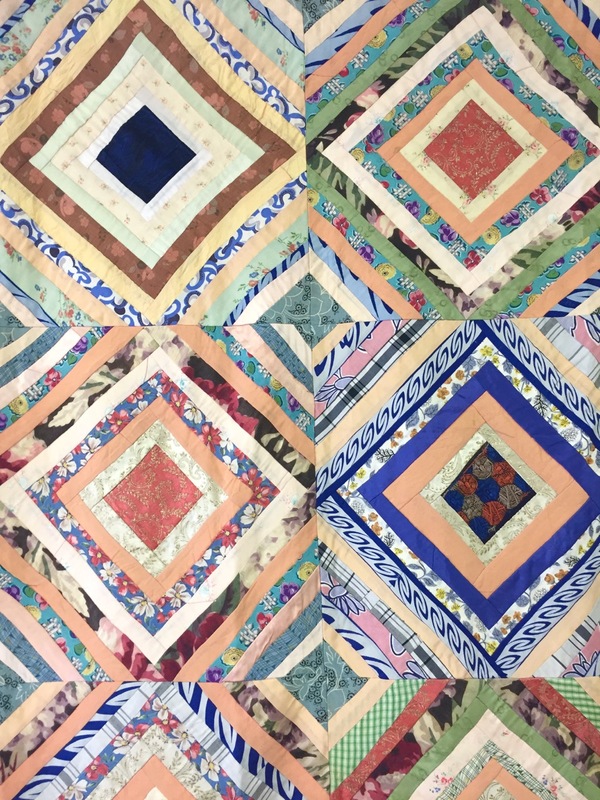 You can also see the mix of threads and stitch styles below. On the Quilters' Guild museum website, you can see other examples of Heritage and Mosaic quilts. Back with more soon! I had a little nudge yesterday from Sarah about a PDF pattern that I'd had my eye on. Turns out it all SewHouseSeven pattern were still 25% off but something held me back. 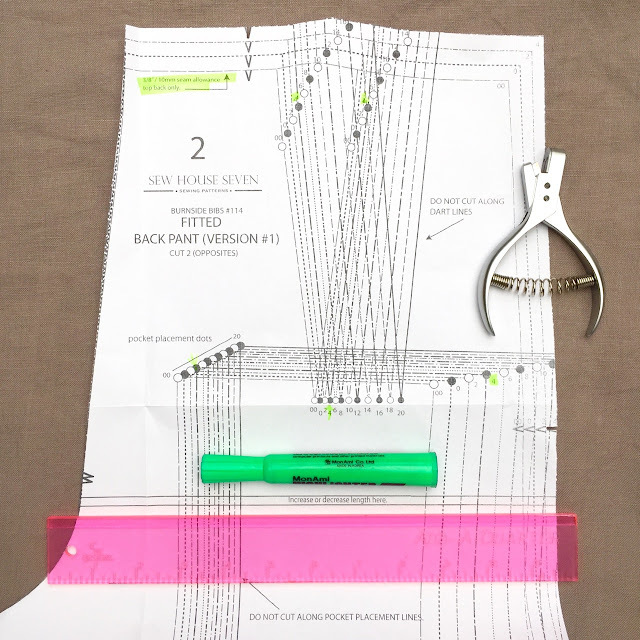 Being a dungaree/bibs pattern, I knew it would take a lot of paper to print and I already have a stack of patterns printed on A4 waiting to be assembled. 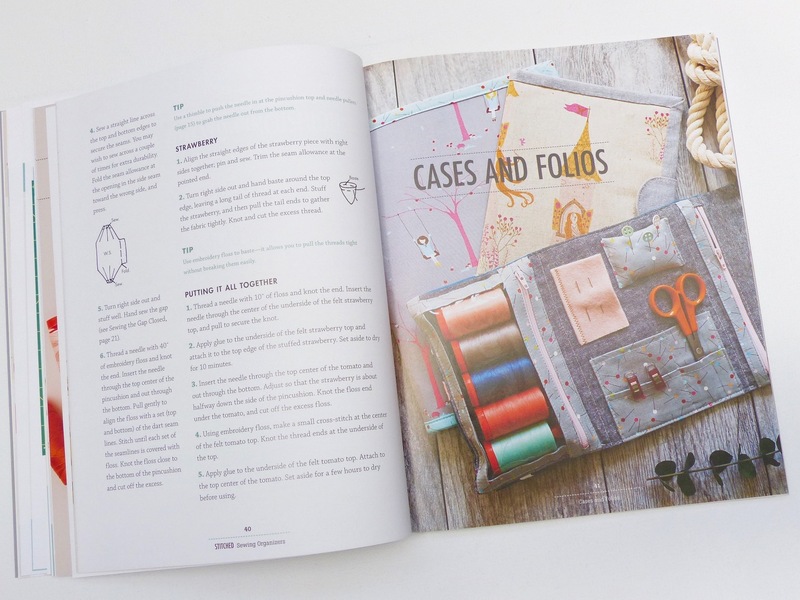 I have been curious about the growing online print shop services starting in the UK that offer copyshop AO size printing- when I've looked at this locally, the service has been difficult to find and when I did find it, very expensive. 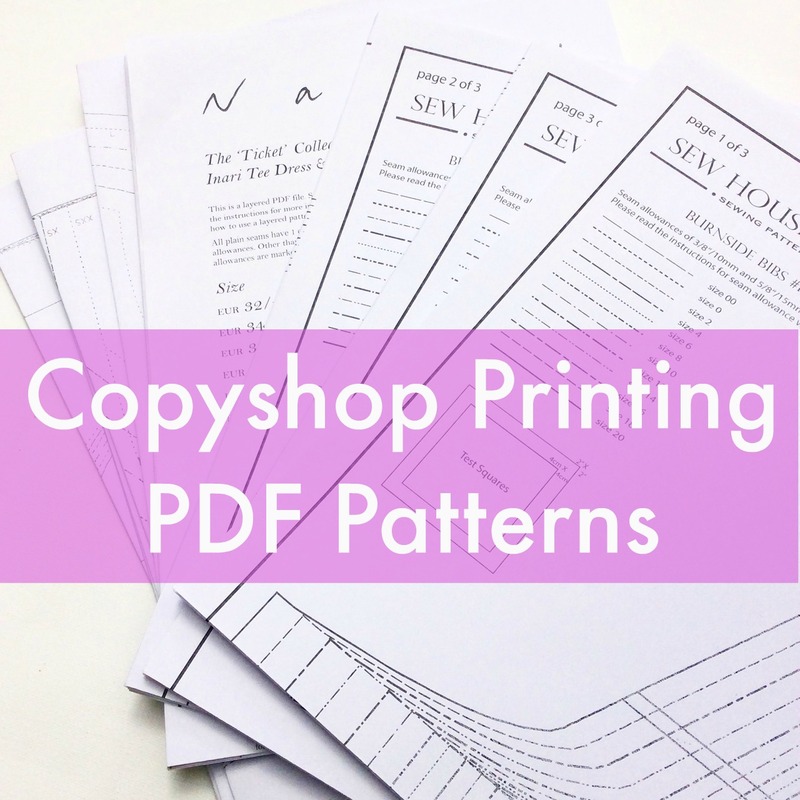 Jenny from Cashmerette wrote a very helpful post, How to Print PDF Copyshop Files Cheaply with services listed for different countries, including the UK. I looked at them all and after weighing up costs, netprinter.co.uk looked like the cheapest option for a few patterns. It's also relatively near to me and I was hoping that the printed patterns would arrive quickly- they did, less than 24 hours! Cost is £0.75 per print (AO size and b/w). 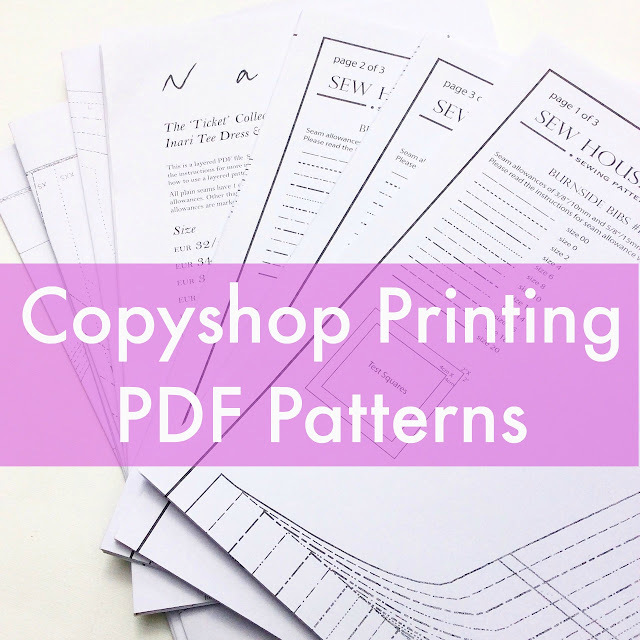 There's a minimum spend of £5 for printing so I went through my Dropbox PDF patterns and found any with Copyshop options that were in my making queue. Some of these I have already printed on A4 paper and they have not yet been assembled so instead I will reuse that paper on other printing. I had 8 sheets in total to print from various patterns, total cost £10.80 including £3 postage and 20%VAT on printing. Time to visit sponsor Village Haberdashery for the latest arrivals...I've focused on some dressmaking and quilting options using the latest fabrics and patterns, plus I've selected three double gauze prints as it's a lovely fabric for summer dressmaking or summer quilts. I've chosen a freshly released dress pattern and fabrics that will work with that pattern. Matilda, shirt dress pattern by Megan Nielsen. The newest pattern from Megan, lovely details including princess seams, collar and stand, and pleated breast pockets. Loomious 2 - Checkered Past in Sky. 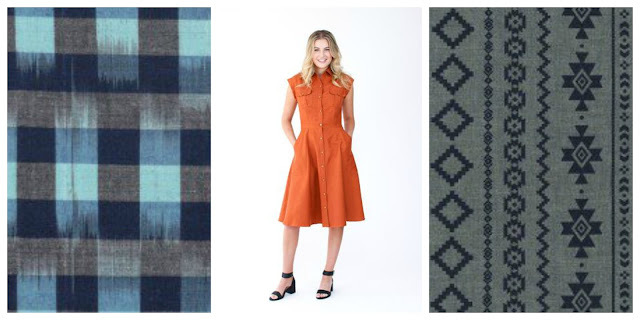 Yarn dyed threads and a gorgeous woven check from Anna Maria Horner. More drape than quilting cottons. Chambray Boulevard Prints - Southwest Stripe, from Robert Kaufman. 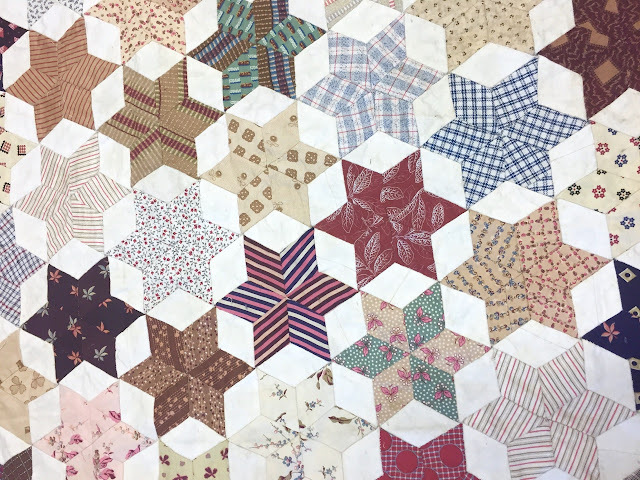 Wider width and a lovely design to play with; the design repeat is 12" x 12". Sevenberry Novelties Strawberries in print, cute fruity print, also see bananas! Menagerie, Rifle for Cotton+Steel. This collection is pre-order, due to arrive sometime in August. There's a range of substrates- quilting cotton. lawn, canvas and rayon, plus the designs are mouthwateringly good! 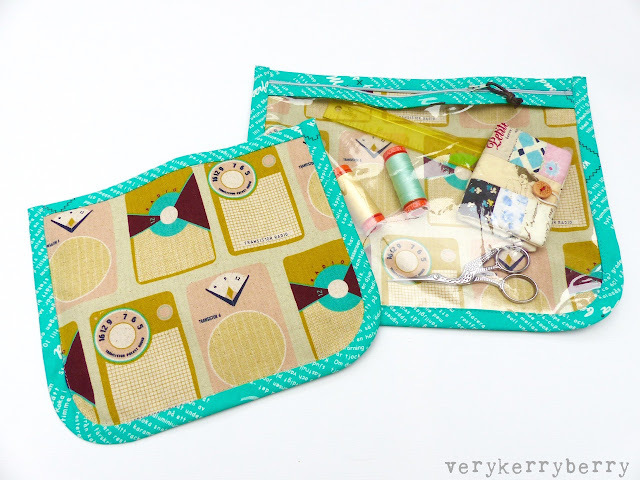 Lille Collection, Chevrons and Arrows from Sew Simple Fabric. Geometric graphic patterns, see the rest of the collection here. 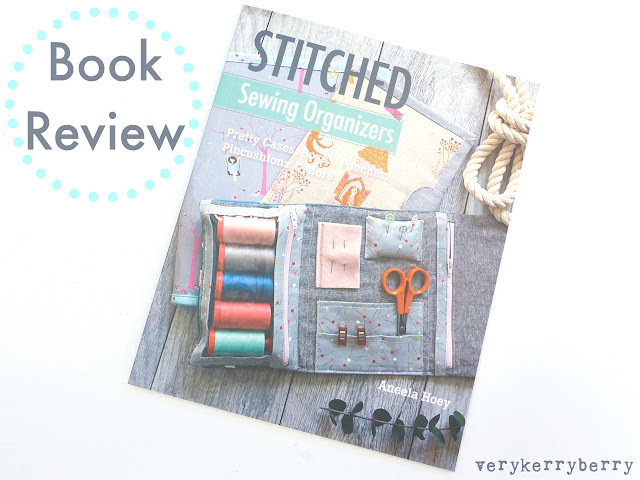 I leapt at the chance to review Aneela Hoey's new book, Stitched: Sewing Organizers I saw some previews on Aneela's Instagram feed and I already could see it was going to be a treat. She writes a good pattern and this book is full of handmade storage projects- what's not to like! 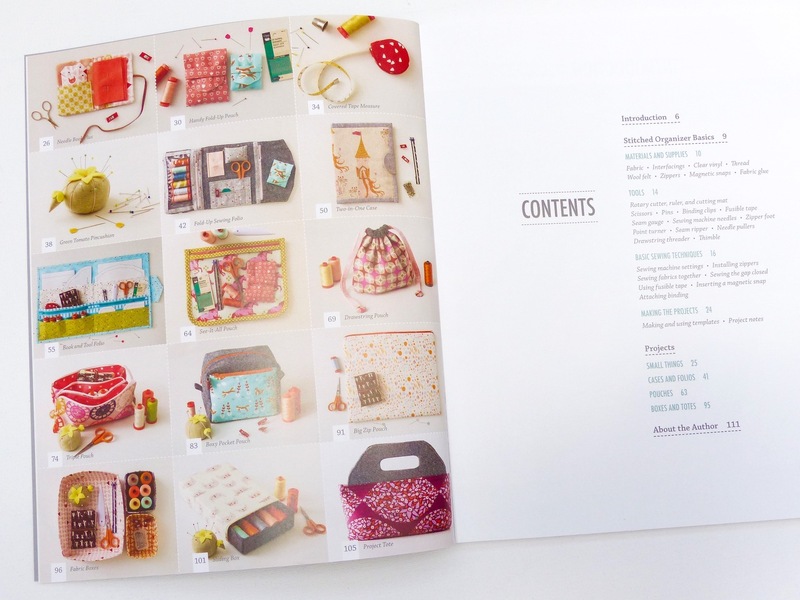 Straightaway, you can see on the pictorial side of the contents page how many beautiful and tempting things there are to make! 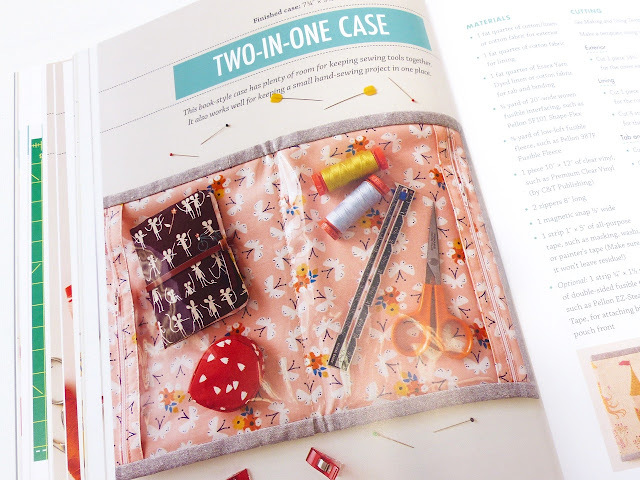 To be honest, on my first flick through the book, I was itching to make something straightaway and needed a quick gift for someone so I made the larger version of the Handy Fold-Up pouch. It was also a good way to read the book in more detail and see how the text and diagrams worked together. I made one pouch and straightaway I made another- it sews up very fast. Even on an apparently = simple pattern like this I could see how meticulous the writing was. She's thought of everything, like the size allowances made for thickness of fabric+interfacing for example, so the finished article truly resembles the photo in the book and the making process is rewarding rather than frustrating. 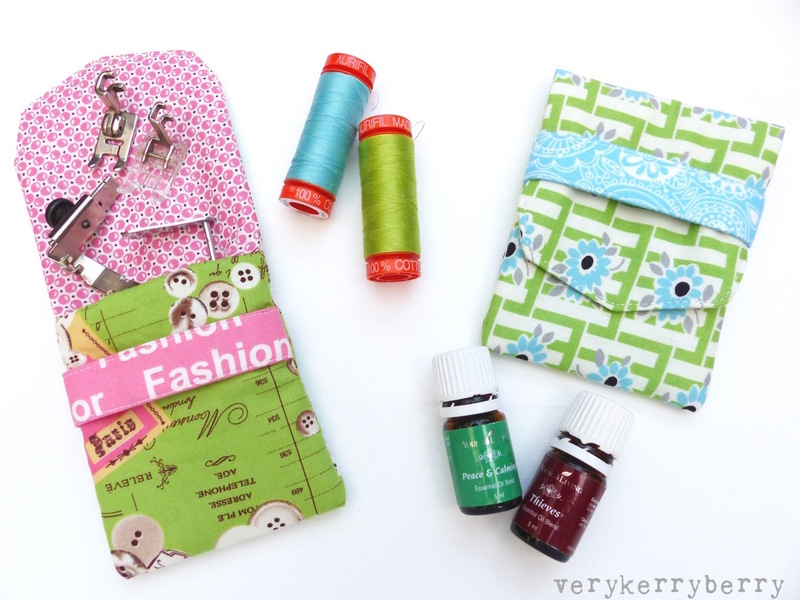 I made one pouch for my new sewing travel machine for foot storage and another for a yoga friend to keep bottles of essential oil, and like many of the book projects it could be made with many different end uses in mind. 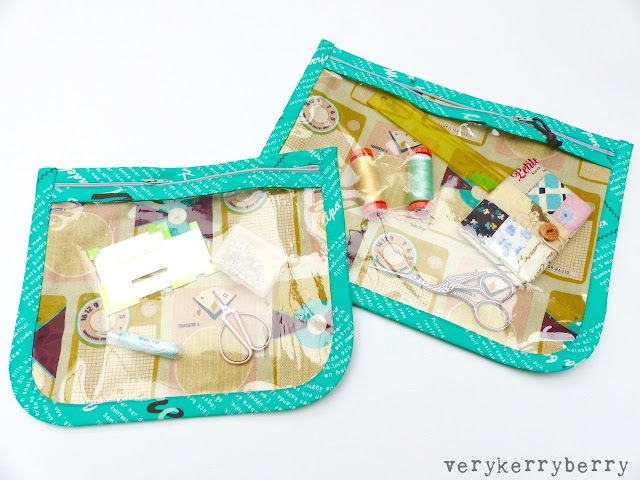 I also made the See-It-All pouch, again another gift was needed for a friend going into hospital for a big operation plus a little one to test out the making. 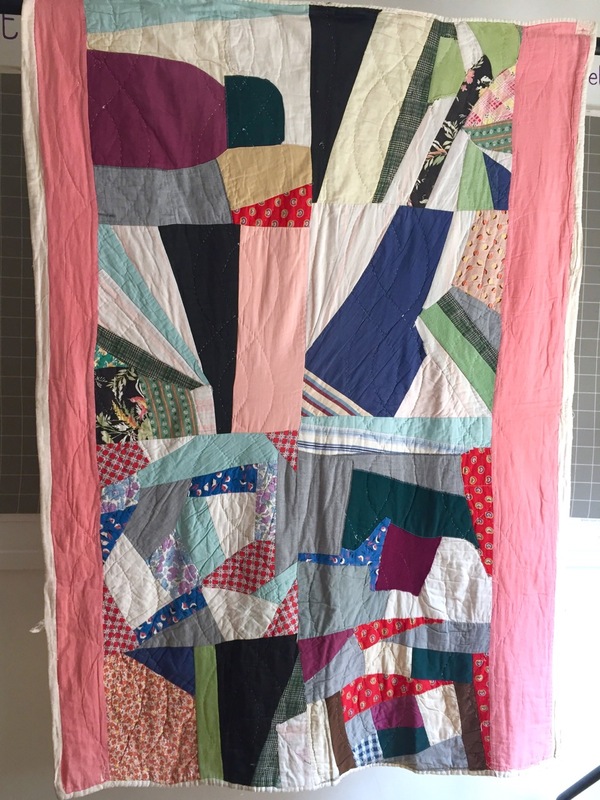 It's a great project for busting out your fat quarters, especially linen/cotton blend with bold prints- I have a few of those that don't really lend themselves to quilting and have prints that I want to see whole and not cut! 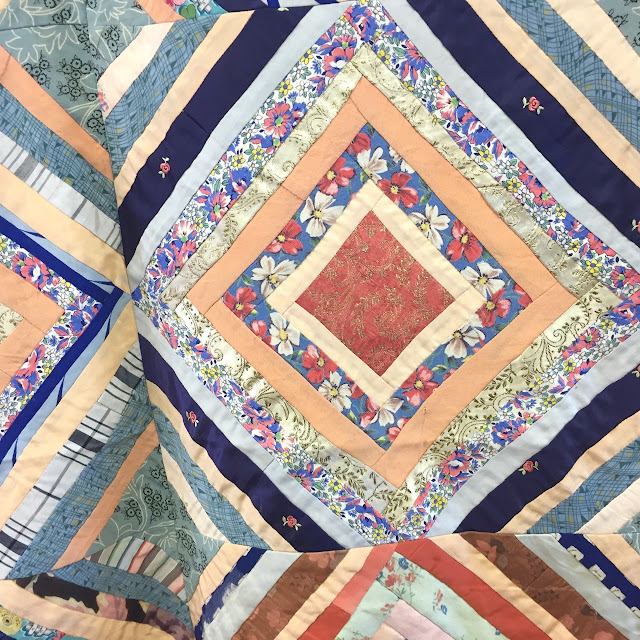 The pouch on the right is the size from the book and the left was made with the remains of the FQ, it was easy to resize and i am imagining making a really big one to keep larger quilt blocks in. 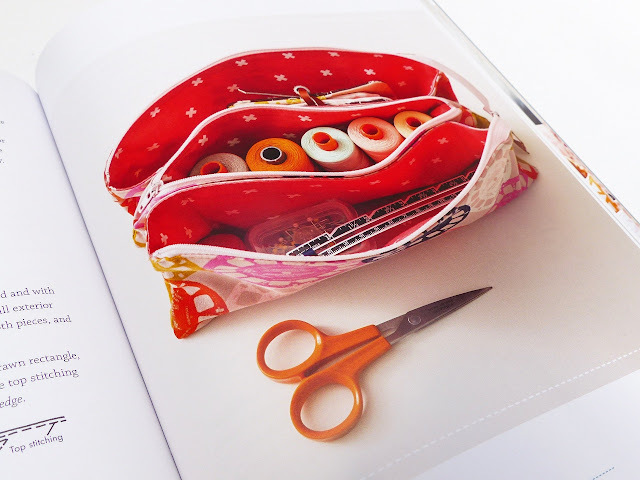 This is a slightly harder project than the fold-up pouch, but still very achievable. 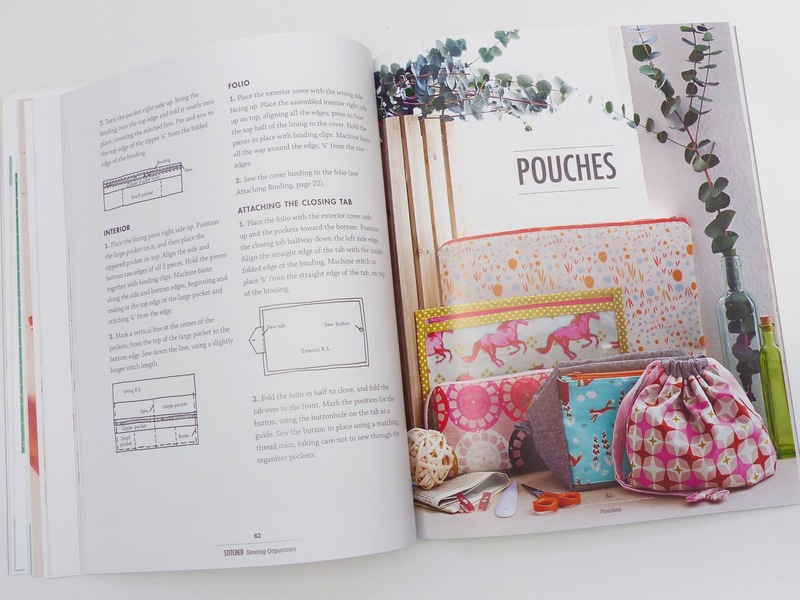 Aneela gives detailed guidance on the zip installation and bindings; read her instructions, follow the diagrams, take your time and a lovely pouch will be the end result! 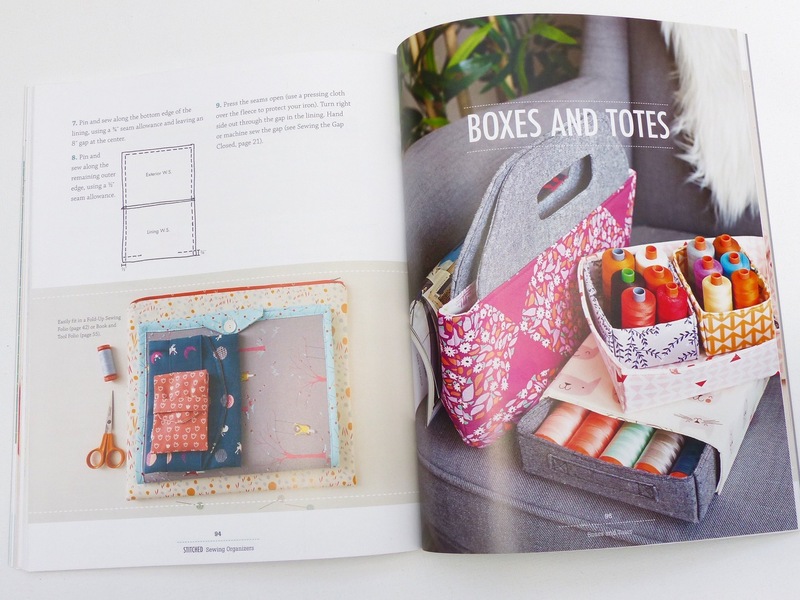 I recognised some of the projects from Aneela's independent pattern shop - the fabric boxes, project book pouch, folder mini pouch, the sliding box and a few others, so buying the book is also a bargain. I have projects lined up to make from now until Christmas: the Two-In-One Case is very appealing as is the Triple Pouch, and if you are taking part in a swap or making a retreat goodie it's a valuable resource. I loved it, lots of things I want to make for myself and lots of things for others. My Christmas making is sorted. If I was Aneela, I would be feeling very pleased at writing such a useful book. 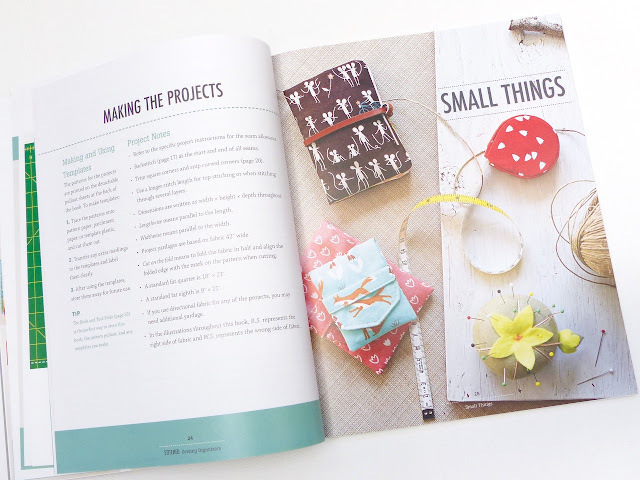 I think it will be an incredibly popular title- don't we all like making organizer projects?! Thank you to Search Press who kindly sent me a review copy.